In this assignment you will expand a web based application to track data about automobiles and store the data in a MySQL database. All interactions will follow the POST-Redirect pattern where appropriate. Note that there is no specific sample code for this assignment. You can look though the sample code from the lecture. It has examples of using sessions and POST-Redirect. Your program must be resistant to HTML Injection attempts. All data that comes from the users must be properly escaped using the htmlentities() function in PHP. You do not need to escape text that is generated by your program. Your program must be resistant to SQL Injection attempts. This means that you should never concatenate user provided data with SQL to produce a query. You should always use a PDO prepared statement. This assignment reuses the tables from the previous assignment. No additional tables are necessary. The changes to index.php are new wording and pointing to view.php to test for login bypass. The basic functionality, password checking using salt and hashing, error logging, and data validation for the login.php is the same as in the previous assignment. The script must redirect after every POST. It must never produce HTML output as a result of a POST operation. 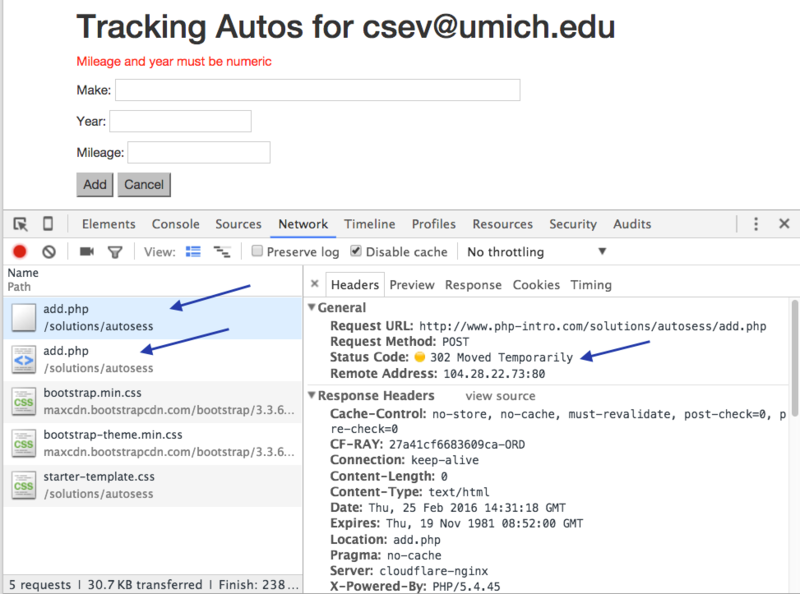 It must redirect to view.php instead of autos.php and must pass the logged in user's name through the session. A GET parameter is not allowed. Subsequent GET requests (i.e. refreshing the page) should not show the error message to properly implement the POST-Redirect-GET-Flash pattern. The autos.php script from the previous assignment is broken into two scripts in this assignment. The view.pbp script shows the list of automobiles in the database and the add.php script handles adding new automobiles to the database but does not list any autos. The view.pbp includes a link to add.php and logout.php and the add.php has a Cancel button. To test, navigate to view.php manually without logging in - it should fail with "Not logged in". In the add.php script, when the "Add" button is pressed, you need to the same input validation as in the previus assignment, except that you must display the error using a proper POST-ReDirect-GET-Flash pattern. A screen shot (including the URL) of your login.php rejecting an account without an at-sign (@). You must also include the developer console network tab showing both the POST and GET. A screen shot of your error log showing correct messages for both a successful and failed login attempt. A screen shot (with URL) of your add.php showing a data validation error. You must also include the developer console network tab showing both the POST and GET. 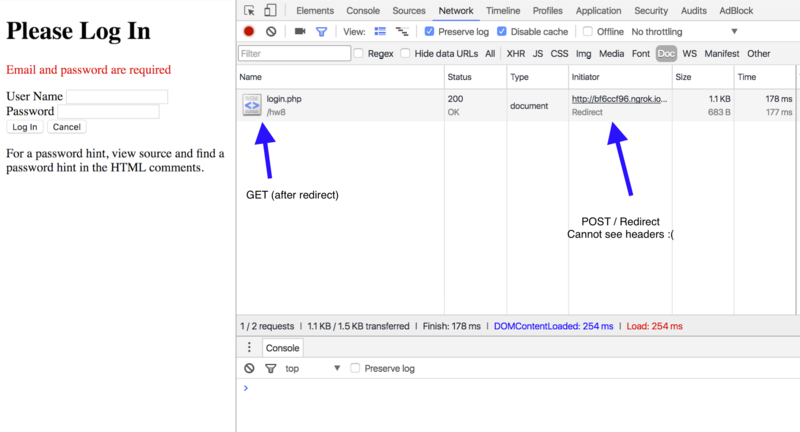 See the sample screenshots below to see how to show a POST-Redirect-GET happenned. Don't take off points for little mistakes. If they seem to have done the assignment give them full credit. Feel free to make suggestions if there are small mistakes. Please keep your comments positive and useful. If you do not take grading seriously, the instructors may delete your response and you will lose points.